HONG KONG—In what is being referred to by some as a “flat-swap gate,” Permanent Secretary for Home Affairs Betty Fung Ching Suk-yee reportedly swapped flats with Chan Ung-lok, the sister-in-law of Macau casino magnate Stanley Ho, to evade taxes. The flat swap was made when Fung was still the director of the Leisure and Cultural Services Department (LCSD). This month, the Independent Commission Against Corruption (ICAC) officially launched an investigation on this flat swap deal, which made Fung the most senior serving officer to have been investigated by the ICAC so far. This is only the latest controversy for the LCSD, which has come under fire for scandals ranging from corruption to political censorship of theatrical performances. Recently, more details have unfolded regarding the political censorship employed by the LCSD to block international performing groups and hinder the exchange of art and culture in Hong Kong. All of these scandals rang alarm bells for the Hong Kong people again, as Hong Kong public servants’ tradition of integrity and neutrality has been increasingly eroded by communist ideology. The flat-swap gate serves as another warning for Hong Kong officials who sell out ethics to flatter the Chinese Communist Party (CCP). On April 1, HK01 weekly magazine revealed that Fung had reached an agreement in 2013 with a company owned by Chan, the sister of Stanley Ho’s third wife. This agreement was allegedly used to evade taxes by swapping Fung’s flat in Robinson Place in Mid-Levels plus HK$6.5 million for Chan’s two adjoining flats in Happy Valley. According to information provided by Fung, on exchange of the deeds HK$585,000 was paid in taxes. However, if the sale and purchase had been made the normal way, the buyer and seller would have shouldered the burden of stamp duty up to HK$5.84 million. After Fung denied knowing Chan was the owner of the Happy Valley flats, media revealed that Fung’s husband, Wilson Fung Wing-yip, the executive director of business development of the Airport Authority, had transactions with Chan 10 years ago when he, as a government officer, was handling the traffic rights and heliport application that was submitted by Chan’s company. This event is allegedly a collusion and transfer of benefits between businessmen and government officers. Earlier this month, Wilson Fung issued a statement on Facebook to announce that he did not tell his wife about his contact with Chan. After the public’s ongoing questioning of Betty Fung’s integrity came the announcement that the ICAC had launched an investigation this month on the suspected transfer of benefits in her property transaction. Before Betty Fung was promoted to Permanent Secretary for Home Affairs, she assumed the post of LCSD Director for the Home Affairs Bureau from August 2009 to August 2014. From 1994 to 1996, she was the Press Secretary for former Chief Secretary Anson Chan and former Financial Secretary Donald Tsang, who later became Hong Kong Chief Executive. 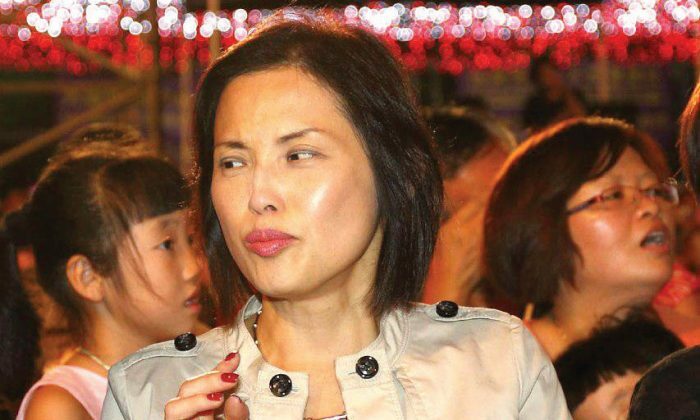 Some local media have described Betty Fung as Tsang’s favourite person, as Tsang also served as the witness for Fung’s marriage. The Fung’s have been experiencing a meteoric rise so far. Before the exposure of Betty Fung’s flat-swap gate, local media revealed that the LCSD had prohibited the troupe “Nonsensemakers” from using the Chinese character “national” in “Taipei National University of the Arts,” which was to be printed in their programme book. Subsequent reports disclosed that the LCSD has long been requiring Taiwanese performance groups or performers to delete the Chinese character “national.” Such an “unspoken rule” is just the tip of iceberg of the political reviews conducted by the LCSD. The “national” incident outraged Hong Kong arts circles and the public. People from all walks of life condemned the LCSD for throttling Hong Kong people’s freedom of speech and creation as well as seriously obstructing the development of arts and culture in Hong Kong. It has been a long time since the LCSD began to cooperate with the CCP to conduct political censorship of performing arts groups. During Betty Fung’s tenure as the LCSD director, Tsang’s government obstructed Shen Yun Performing Arts, a top international arts group based in the United States, from performing in Hong Kong. In 2009, the Hong Kong Association of Falun Dafa, as the host for Shen Yun’s performance in Hong Kong, organized seven shows in the Hong Kong Academy in January 2010. However, because the Hong Kong Immigration Department refused to grant entry visas to six key technicians, the performance had to be cancelled. In April 2010, the host filed a judicial review to charge the Hong Kong Immigration Department with illegally disapproving the visa application. On March 9, 2011, the High Court ruled in favour of the host. Since 2011, the Shen Yun organizer has continued to apply to the LCSD for hiring government venues, including Hong Kong Cultural Centre, Tsuen Wan Town Hall, Sha Tin Town Hall and Tuen Mun Town Hall. More than 100 applications were submitted, and they were all rejected. Many politicians believe it is evident that the Hong Kong government cooperates with the CCP to conduct political censorship of performing arts groups. This has turned the Hong Kong government into an international laughingstock, since the LCSD, though it is in charge of multiple performance venues, cannot approve an application for hiring one of its venues for a first-class international arts troupe. Established in 2006 and headquartered in New York, Shen Yun Performing Arts mainly features classical Chinese dance. Last year, Shen Yun’s four performing groups toured the world, performing more than 400 shows in top theatres including the Lincoln Centre in New York, the Kennedy Centre in Washington, DC, and the London Coliseum. In many of these notable venues, Shen Yun miraculously broke the box office records. However, because the content of the show is entirely beyond the control of the Chinese communist regime, Shen Yun Performing Arts has so far been unable to set foot in mainland China or Hong Kong. In August 2012, the television network New Tang Dynasty Television (NTDTV) from the United States held a preliminary round of its International Classical Chinese Dance Competition in Hong Kong for the first time. Ms Lin, who was responsible for hiring a venue for the competition, revealed to Epoch Times her strange experience with the LCSD. When she personally went to the Ko Shan Theatre to apply for a venue, a female staff member checked a large booking schedule and told her the available dates. She also taught Lin how to fill out the application form. However, after the application form was submitted, the Ko Shan Theatre said all venues had been booked. That year, all LCSD venues said they were unable to accept this application. This year, NTDTV will hold the seventh International Classical Chinese Dance Competition, and the preliminary round in the Asia-Pacific region will be held in Hong Kong. According to the organizer, the LCSD still refused to let the competition use any venue belonging to the LCSD. During Betty Fung’s tenure as the LCSD director, scandals involving political censorship of art performance troupes occurred many times. On the other hand, the door of the LCSD opened wide to arts groups from mainland China. For example, in August 2011, the LCSD invited the CCP National Ballet to perform Red Detachment of Women in Hong Kong. This was criticized widely by the public, as it was trying to move the CCP’s brainwashing model operas to Hong Kong. In recent years, the LCSD has always invited performance groups from mainland China to Hong Kong to celebrate the Mid-Autumn Festival, the Lantern Festival, and New Year’s Eve. In addition, former Chongqing Party Secretary Bo Xilai, who has been jailed for life, launched a political campaign called “Sing red, strike black” in mainland China before he stepped down. In February 2012, Bo organised a large “red song group” of about 500 people to come to Hong Kong. They claimed that they sang “authentic” red songs. Their performance venues included the concert hall inside the Hong Kong City Hall, which belonged to the LCSD. However, this red song performance was criticised as a reproduction of the Cultural Revolution and received the cold shoulder from Hong Kong people. Translated by Thomas Leung Written in English by Sally Appert.